I would have been 12 weeks next week. The point at which you can go public about the little life growing inside you. I was never one of those females that dreamt about being a mom. But then we were told getting pregnant was going to be more challenging and the contrarian in me wanted nothing else other than to be just that. We found ourselves in the middle of the fertility clinic world and after three months we were exhausted with it. So we quit, and we trusted if getting pregnant was supposed to happen, it would have to happen in a more holistic way. But then the unexpected occurred and we laid eyes on a positive pregnancy test just two weeks after walking away from the fertility clinic. We chalked it up to what happens when you surrender and quit forcing things. And we were elated. Blood work was taken and everything looked just as it was suppose to. John and I headed off to New Zealand and Australia with a onesie in hand and a selfie stick in the other so we could capture photos of our growing family of three. Once we got back from our trip, we had our first ultrasound and laid eyes on a precious fluttering heartbeat. Everything looked good. We were asked to come back one more time the following week just to make sure things were progressing as they were supposed to. So we did, and while there was still a heartbeat, the doctor looked us in the eye and said things didn't look promising. The baby wasn't growing as it needed to. She told us to prepare for not having a heartbeat at the next appointment. She told us there was little room for hope. It might sound crazy, but we walked out of the appointment vowing we would not go back to that clinic. Because we were hoping. Our whole hearts were already captivated by that beating heart. So we rallied our friends and family together and we asked that they too stand in faith with us. We asked them to intercede on our behalves. And they did just that. Amidst the turbulence of the news and the odds, we felt peace and more than anything: hope. Hope is an interesting word. It is one my soul sister, Lauren, the one who led me to Jesus, spoke and proclaimed over my life almost eight years ago. Romans 15:13 served as a guide post. 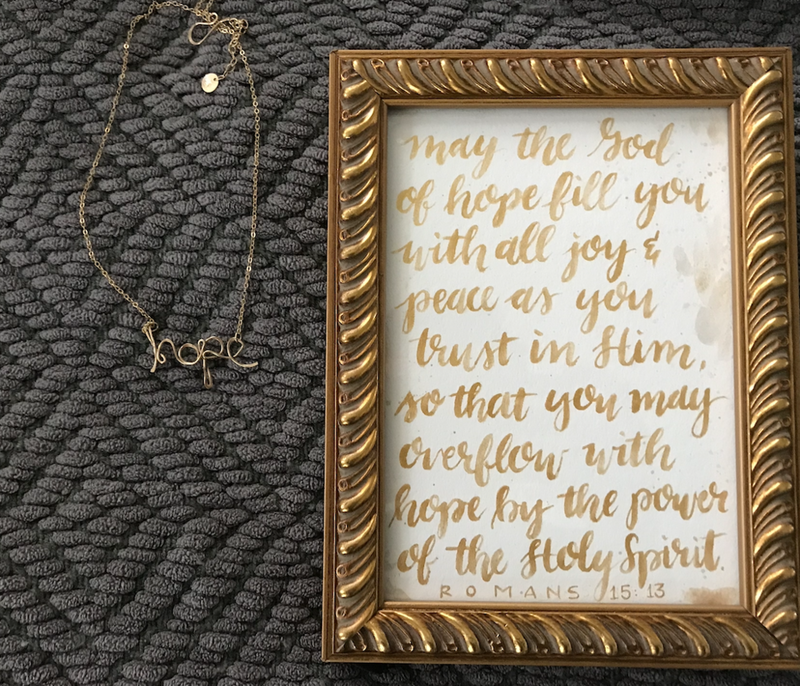 Shortly after surrendering my heart, Lauren, gave me a necklace with the word hope on it. And I've worn it around my neck for almost the past decade. As we drew nearer to our next appointment with a new practice, now more than ever, I was praying for this word hope. I was hoping for a miracle. I was hoping we would beat the odds. I was hoping God would show up and show out and that we would hear a heartbeat. I had decided in my heart that if we were to lay eyes on this child and it was a girl, we would name her Hope. Because this season was marked by that word. The day before the appointment a dear friend prayed over me. As she said amen and we parted ways, she said she saw this little blonde haired girl running through a beautiful green field. And as crazy as it sounds, she said she kept hearing the word "Hope", and perhaps that was to be her name. She had no idea that name had already been chosen in my heart. And when I heard her words, I wept. I wept for many reasons, but the thought that first came was that it sounded like she was in heaven. And my heart broke at that thought. But we kept hoping for that heartbeat...we kept standing in faith begging God for another outcome. On Thursday, we waited for that heartbeat. They started with one machine, but nothing. They went to another, but nothing. And then we went to the most advanced, and it was confirmed with finality: There's no heartbeat. Over the past couple of days John and I have wondered at times if our own hearts are still beating. Because the pain of no heartbeat has broken us. We've never felt such physical and emotional loss. And what about Hope, now? Where do we go with these shattered hearts and wrecked dreams? 1 Peter 1:3-7 keeps coming in front of me. Our Pastor preached from it on Easter, it was where I landed in my quiet time on Sunday, and I've seen it several other times in the past couple days randomly. "Praise to God for a Living Hope"
I didn't dive into commentaries or study that passage in depth, I just held onto "Praise to God for a Living Hope." It was as if in that moment the Lord spoke directly to my heart: I've got her. She is living here in heaven with me. You will see her. Until then, trust she is safe in my arms. I still want answers. My heart wants to know the why. But this, this has been enough. It doesn't take away the pain and the anger, but it does provide a deep rooted peace John and I have both felt. "Praise to God for a Living Hope." A peace in knowing we will see this sweet life one day. A peace in knowing we are not walking through this storm alone. Neighbors, friends, family, and people we never expected have shown up, spoke up, and have loved us in the midst of the ugly cries and the rawness of the loss. They have literally been the arms of Jesus as they have embraced us through it all. And we have felt the love of God invade our lives and take root in what feels like a crater in our hearts. And we have felt His presence in the most tangible of ways. We've not lost Hope. Instead, we are fighting for it. Our hearts have been reminded through all this of the power of living for heaven. This life is temporary, it all will be stripped away: the money, the job, the house, the things... but Hope, this is what we live for. Heaven, it is what our hearts long for and because of it, we will keep our eyes lifted above until we reach our eternal home. It was not a coincidence "hope" has been worn on my heart for so long. And it is the word I will keep wearing on my heart and around my neck until I lay eyes on that precious life. The heart behind this blog has always been for it to be a space where people can relate to the story being told. I've never wanted for it to become too preachy or overly in your face about Jesus...but today, today I feel a little different. Friend, if you are reading this and you find that your life has become defined by pursuing the comforts of this world, they will not last. They will not hold when the storms come. You can keep running to different avenues, but at some point, they will break. Just know there is another way. Another path. One that is defined by no assurances of a perfect life here on earth but rather a life that looks up through the trials as it rests in the truth God's grace and the hope of heaven will and can sustain you. People don't talk about miscarriages openly. But for us, talking has been crucial to the processing and the healing. If you've walked through this storm, my heart physically hurts for you. And if you ever go through this storm, know you're not alone. The world will tell you to be quiet about it, but you don't have to listen. It has been the women I've known who have suffered such loss and have been open about it, that have helped me more than I will ever be able to comprehend. They've been there to ask the painful questions to; they've been transparent and it has been such a source of relief. And men, the same goes for you. This journey is just as painful, the loss is just as severe, I pray there is someone in your life you can talk to about it. You might think I am crazy for writing about this so soon, and that's just fine. If you've walked this journey, if you're walking this journey now, just know you're not alone.